Yes, it’s been over two years since I last posted about the woods. Last year was a blast. I turned up after the worst of the winter was over to discover someone had cut the padlock off the gate and had put horses in the field. No photos because they only show a mess. Spring rescued the situation though, and most of my trees were ok.
After a good summer, the trees are beginning to show some good growth. Here’s one of the best with Mrs A, taken in October 2016. This was about 60cm when planted; now it must be around 3m. 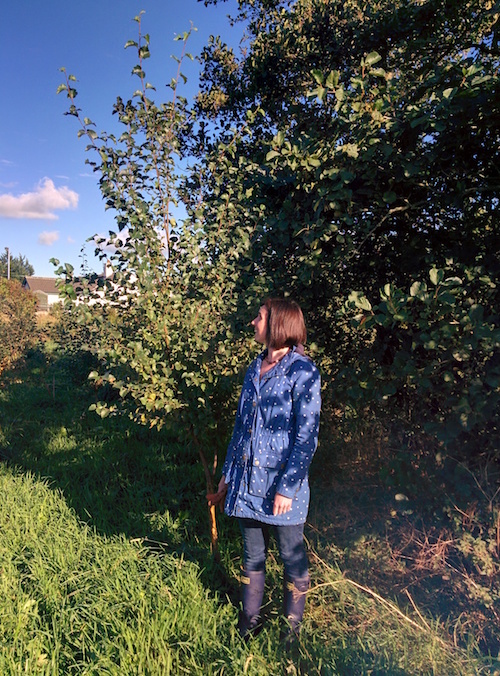 In November, I bought another 53 trees, 48 of which I planted in the woods. These were to replace those that didn’t survive the first 3 years. To add to the 1050 trees I initially planted. 10 April 2014 - Trees!